David Dodd Lee has been there with me since the beginning—not since the beginning of my reading and loving poetry, but of my writing poetry and taking that progress seriously. Of taking poetry seriously, and the idea that there was something to be taken from poetry, to be understood, to be had. Like a physical object you can pull off the page each time, and put in your pocket, and take with you. That’s how I feel each time when I read a poem, let alone a collection, by David: that I am taking something with me—whether or not it is my choice. Some burden almost, some understanding, some new being even. Something in me has changed after having read David’s work. I tend to feel calmer, a little newer, but unsettled, too. Good poetry tends to do that to me. It will renew me first, and then it will rattle me. That’s what happens with David’s work, every time. Sometimes it takes a minute to go inside, knowing that; and it takes a minute to come back out. It takes a minute to shake it off. More and more, I find myself drawn not only to David’s images (I’ve always loved David’s images—and his blending of perceptions), but his use of narrative, and how he bends it. I’m particularly interested in the somewhat sinister quality that creeps into that narrative from time to time, but also the female figures that he introduces, who are obviously not all the same woman. This interest is not all the book’s doing, of course; partially, this is just where I am in my own writing life, and where I draw my personal inspirations from… but I believe he’s doing imagery, narration, the sinister, and the female figure exceptionally well in this collection—hence the term Animalities, or, our animalistic (or more primal) qualities. How fitting. But not too fitting—that would be too clean. a cork pops out of the life raft. The cook wears a pea coat. wagon under a traffic light . . .
the blur of test tubes where a tear might throb . . .
her fingertips stuck to my arm like sawdust. for the claw-footed tub to fill up. Isn’t this poem lovely? Doesn’t it just stop you in your tracks? It floors me, every single time—and it’s that pea coat, that black light, that claw-foot bath tub, and that ending—those last four lines, so unsettling. As I stated earlier, I’ve always loved David’s imagery—and this “ocean” and mayonnaise jar are as vivid as they come—but I’m particularly impressed with his latest use of narration, and how that pairs with his imagery, especially in these poems. As a poem in five sections, I’ve considered time and time again its sequence—but I’ve realized the where and the when is somewhat inconsequential. I assume it is evening, but I’m more interested now in the repetitions and variations: every sequence includes flesh and water, and nearly every sequence includes food, but not every sequence includes music—but somehow there’s an echo of it just the same. It’s that distortion of perception that I’ve come to love in David’s work, and that’s why I’m addressing sequences. For example, in the first section, the two characters are on a life raft; in the second, they are under a black light; and in the third, they are under candlelight, and “her fingertips [were] stuck to my arm like sawdust” (30). Such a strange, beautiful progression—from location to location, from light to light, from sawdust to a bathtub to a windshield and a mayonnaise jar. These movements are what I look for, out of instinct, in David’s works now, because I love them, and because I believe this is what makes them tick. In addition to his sequential work, there is also the sinister nature of many of his poems, including the ending of this one, and the transformation of his female figures. I’ve really never felt that David’s poems are overly sinister (and there are certainly some poets where this is arguably the case); there is simply an element, an edge, to his poems—supplying a woman with an image of nothing short of a murder scene when she requested an ocean? Sinister. But after all of the surreality, and the beautiful imagery work earlier in the poem, the poet is able to get away with this, and the moment is even unstated, because it achieves such a balance. It achieves an edge, rather than dominance. Pair that with this female character in particular and, well, it’s just a gorgeous poem. I can’t arguably say what draws me so much to this particular character, except for how she is presented through distortion—which, once again, just reinforces my point for this poet’s handling of perception and the rewriting of perception. All of that being said, I know there are other poems, which I will not take time to list here, where the female figure is much more present and solidified, but perhaps what I love so much about this is figure is how her personality and perspective is impressed upon by what happens around her. Really, what else is there to say—I greatly admire David Dodd Lee’s work, I have enjoyed this collection repeatedly, and I cannot recommend it highly enough. If you have read his work before and enjoyed his imagery, you will not be disappointed, and you will appreciate the newfound relationship with the narrative. If you are new to David’s work, you are in for a treat. Imagery, narrative—and throw in wonderful sinister (and sometimes sweet) edges, and female figures like in this poem—you can’t go wrong. 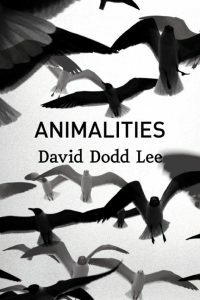 DAVID DODD LEE is the author of eight previous books of poems, including The Coldest Winter on Earth (Marick Press, 2012). His fourth book, Sky Booths in the Breath Somewhere, the Ashbery Erasure Poems (BlazeVox, 2010), taught him how to write the poems in his next books: The Nervous Filaments (Four Way Books, 2010) and Orphan, Indiana (University of Akron Press, 2010). He is the editor of two poetry / fiction anthologies: Shade 2004 & 2006 (Four Way Books) and The Other Life: The Selected Poems of Herbert Scott (Carnegie Mellon, 2010). His poems have appeared in Court Green, Denver Quarterly, Field, Jacket, The Nation, Nerve, and in many other places. He is also a visual artist, writes and publishes fiction, publishes chapbooks and full-length titles as editor-in-chief of 42 Miles Press, and teaches classes in poetry, publishing, art history, and the art of collage at Indiana University South Bend, where he is assistant professor of English. He lives in Osceola, east of South Bend, where he kayaks and fishes on Baugo Bay. David Dodd Lee’s latest book, And Others, Vaguer Presences: A Book of Ashbery Erasure Poems, is now available for pre-order from BlazeVox Books and Amazon.